FREE 5 YEAR/100K WARRANTY!! SEE MORE PHOTOS OF THIS VETTE AND 125+ OTHERS FOR SALE AT WWW.BUYAVETTE.NET! Code correct Riverside Red exterior, code correct Black vinyl interior, Black convertible top. 327ci engine, 4 speed manual transmission. 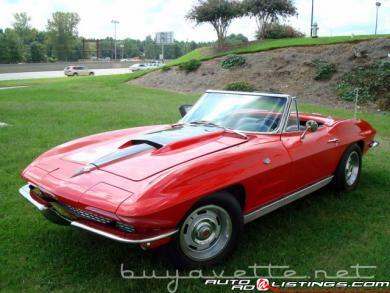 Believed to be an original Georgia car, this 1963 Corvette Convertible has tons of eye appeal with its correct Riverside Red paint, and represents an excellent value in midyear convertibles. Trim tag shows an assembly date of October 4, 1962. The paint on this car is very recent, and is in good condition. Convertible top is older, and is getting a little dry and difficult to see out the back of. Front chrome bumpers are new reproductions, and the rears are originals in overall good condition. Taillights are in very good condition with no cracking, and the weatherstripping is excellent, looking to have just been replaced. This 1963 Corvette Convertible wears a 1967 427 style hood, but otherwise has a completely original body. A set of 1967 style rally wheels have been added, and are in good condition with fair condition center caps and trim rings. Tires are Michelin Energy blackwalls with about 30% tread remaining. The interior of this 1963 Corvette Convertible looks nice and is in mostly original condition. Seat covers and door panels are very good with no apparent issues, as is the dash pad; carpet looks to be recent with no fading or major wear. Center console and gauges are in good condition, and a set of newer style reproduction GM seatbelts have just been installed. Glovebox door shows some wear from age. Original AM/FM radio is still in place, and a Hurst shifter has been added as well. The brakes on this car have recently been gone through, and a tune-up has been performed as well. Believed to be a CE replacement block, the engine in this car shows casting number 3959512, and casting date October 18, 1968. Exhaust manifold casting numbers correspond to a 1970 350ci 300hp engine. This engine sports a very rare and valuable 1970 LT1 aluminum intake as well, and a new Holley carburetor. A set of finned aluminum valve covers are also installed. Frame appears to be straight and rot-free. Call us today before this incredible value disappears! Factory features include 4 speed manual transmission, AM/FM radio. FREE 5 YEAR/100K ADDITIONAL MILE WARRANTY!! Our Price: $34,900. Financing Available.